I have a culinary wheelhouse. When in doubt, I almost always fall back to something Asian inspired with ginger, garlic, soy sauce, and a hint of heat or something Tex Mex or Mexican related with garlic, beans, meat, and -in all likelihood- a metric ton of cheese. And people, I’m happy like that… But every now and then I remind myself to branch out and I’m always, ALWAYS rewarded for that effort. Case in point: Slow Cooker Italian Shredded Beef. 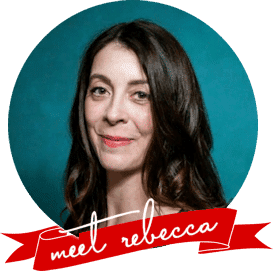 I grabbed an eye of round out of the refrigerator and was reaching for a knuckle of ginger to go in my normal direction, when I pep talked myself into taking a chance. I brainstormed for a minute or two and decided to go Italian. Now this may not be revolutionary, but in my house, it’s a definite departure from the norm. I seared off the beef and dropped it into a slow cooker. The pan went back over the heat and I sauteed some onions and garlic before adding fire roasted diced tomatoes, beef broth, red wine, sun dried tomatoes in oil, crushed red pepper flakes, capers, and green olives to the pan. As it boiled, I scraped the bottom of the pan to incorporate all the lovely little toasty brown bits the beef had left behind then poured it all over the seared roast in the slow cooker. The Slow Cooker Italian Shredded Beef was under way and it smelled divine. I was congratulating myself heartily with four hours to go on the cook time. Four. Long. Hours. of sniffing the air longingly. FOUR HOURS. Now, admittedly, this isn’t forever when viewed through the lens of a lifetime, but people, it’s HARD to smell garlicky beef with all sorts of goodies when you’re really hungry enough to eat one of your own children if they hold still long enough. 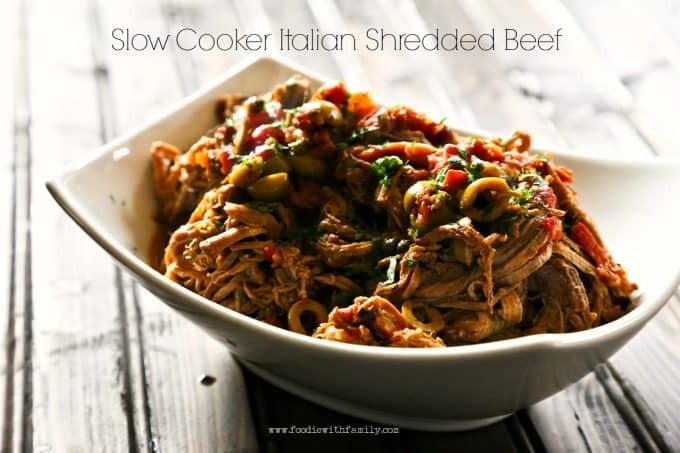 When it was fork tender, I shredded it into bite sized pieces and tossed the Slow Cooker Italian Shredded Beef through with all the good stuff that it simmered in for the afternoon. 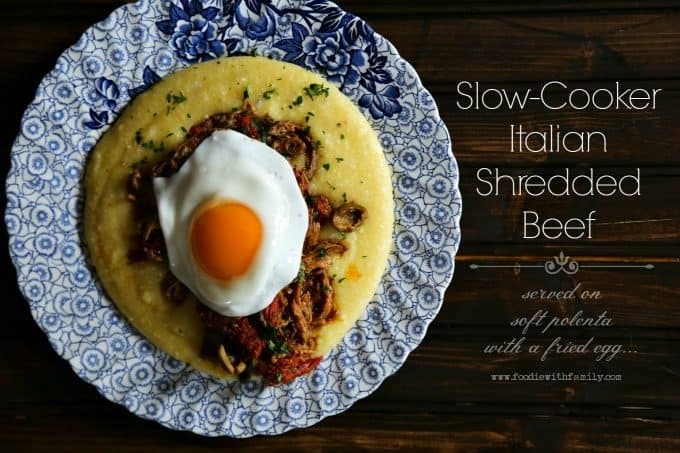 That night, we ate it over soft polenta, but we all agreed that Slow Cooker Italian Shredded Beef would’ve been lovely on rice, noodles. or crusty rolls, too. …the day after this dinner, as my husband happily munched on the leftovers he said, “This is definitely one of my favourite things you’ve ever made. It’s in the realm of ‘perfect food’ for me.” If that doesn’t convince you to give it a go, I don’t know what will. Boneless beef eye of round is a very economical cut of meat. You don’t need to do much work with it to prepare it, but you should trim the excess fat from the round before searing it. 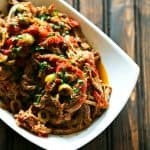 I do so love fire roasted tomatoes in Slow Cooker Italian Shredded Beef. I think they add a little special something to the party. If you can’t find them, though, and don’t want to order them, you can absolutely substitute a can of petite diced tomatoes for them. When it comes to sun-dried tomatoes, I buy this kind by the case. I know they’re available at many grocery stores, but they’re wicked pricey around me, and when I use them, I tend to go in streaks of using a LOT of them, so it all works out for me. Sprinkle the trimmed beef round generously with salt and pepper. Drizzle the oil in a heavy-bottomed frying pan set over high heat. Sear all sides of the beef round for several minutes, or until browned on all sides. Use the tongs to transfer the roast to the slow-cooker. Return the pan to the burner and lower the heat to medium low. Add the onions and garlic to the pan and sautee just until fragrant. 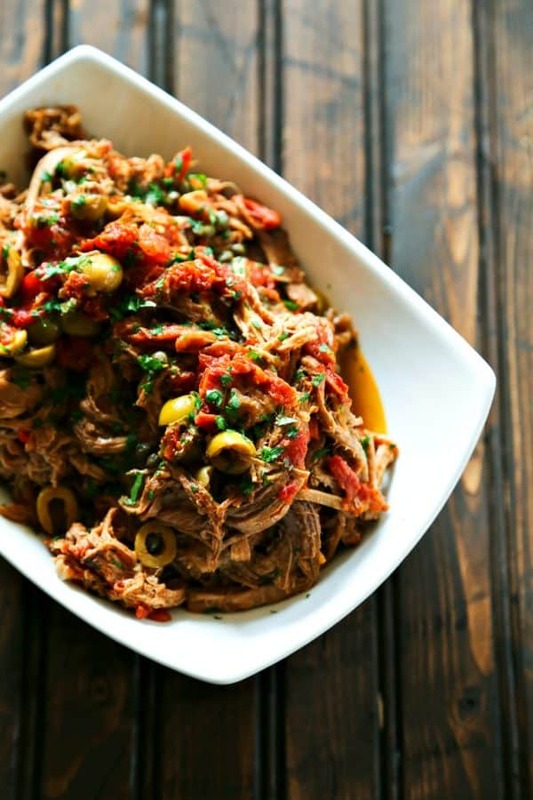 Add the beef broth, red wine, sundried tomatoes AND their oil, green olives, capers, roasted red peppers, and tomatoes and raise the heat back up to HIGH. Bring to a boil, scraping the bottom of the pan to release any of the beautiful brown bits the beef left behind. Allow the mixture to boil for one minute, then pour over the beef round in the slow cooker. Cover and cook on HIGH for 4 to 5 hours or LOW for 6 to 8 hours. Carefully transfer the beef to a rimmed plate or dish. Use two forks to shred the beef before returning it to the slow-cooker and tossing to distribute everything evenly. Serve over polenta, noodles, rice, or on crusty rolls. This looks great! I am making this tonight with parmesan risotto! Update: Made this last night for dinner. I didn’t have capers or olives, so I substituted a jar of olive tampenade from Trader Joes. Served it with parmesan risotto and roasted lemon asparagus. Hubby raved and raved! We have plenty of leftovers for another meal, so I’m going to try it over polenta rounds with shaved parmesan cheese on top. 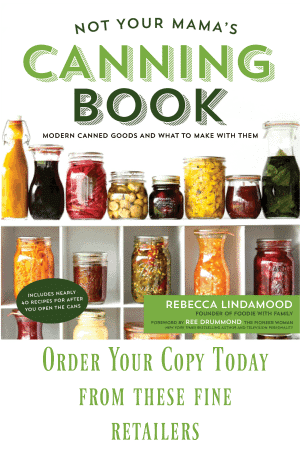 Thanks for this recipe – definitely a keeper! Can smell it from here!Looks and sounds amazing!